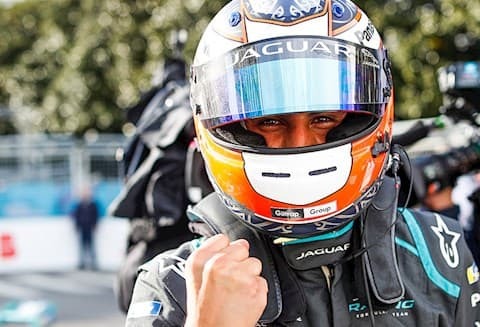 Panasonic Jaguar Racing’s Mitch Evans claims his and his team’s first victory in Rome with DS Techeetah’s Andre Lotterer in second and HWA Racelab’s Stoffel Vandoorne scoring his team’s first podium finish. Poleman Lotterer pulled away from Panasonic Jaguar Racing’s Mitch Evans close behind in second and Geox Dragon’s Jose Maria Lopez in third. With all cars running downhill, Lopez teammate Max Gunther slid sideways through turn eight, clipping the wall, which sent his front splitter flying across the track. Moments later, his teammate Lopez struck Envision Virgin Racing’s Sam Bird, sending him into the wall and limping back to the pit lane. Following Lopez incident with Bird, the Argentinian Geox driver failed to make it through the chicane, crashing into the wall on the apex of Turn 19. With no where to go, HWA Racelab’s Gary Paffett collided with Lopez before DS Techeetah’s Jean-Eric Vergne went into the back of Paffett, ending the Brit’s race. With the red flag out, racing was suspended while the cars were recovered from the track, stopping the clock temporarily with 42 minutes left to go. Once the racing had restarted, Lotterer pulled away with Evans in second and HWA’s Vandoorne chasing them down in third. Lotterer, hungry to regain the lead and claim his first win in the series, hunted down Evans using his final ATTACK MODE to try to overtake but to no avail. Evans took the victory with Lotterer close second and HWA’s Stoffel Vandoorne claiming both his and the teams’s first podium finish. Reigning champion Jean-Eric Vergne couldn’t replicate his form from Sanya, failing to score points after being caught up in the first lap melee with Jose Maria Lopez and Gary Paffett that eventually brought out the red flag. Vergne was later penalized for overtaking Da Costa under Full Course Yellow – dropping him further down the order. Previous articleCan Vettel Cope With the Pressure?